In the event that a virtual server’s operating system crashes, how can the hosted cloud services be automatically recovered? 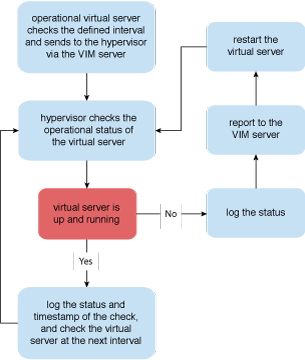 A virtual server whose operating system suddenly fails needs to be able to have its hosted cloud services automatically recovered. The virtual server’s activity is constantly monitored and traced for recovery, in the event of an operating system failure. 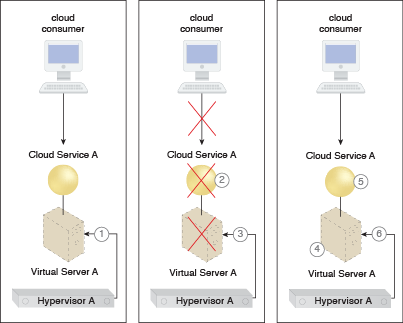 Applying this pattern involves specific techniques and mechanisms that are used by the hypervisor to check the operational status of the virtual server. After the crash, Cloud Service A becomes available again. The steps involved in applying this pattern are shown.